Communication is ubiquitous, intrinsically subjective, and schematical in structure and function. 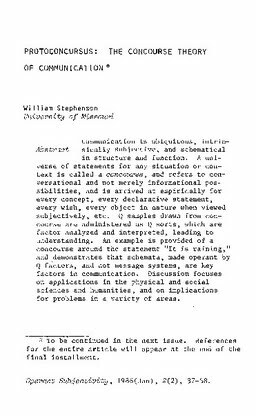 A universe of statements for any situation or context is called a concourse, and refers to conversational and not merely informational possibilities, and is arrived at empirically for every concept, every declarative statement, every wish, every object in nature when viewed subjectively, etc. Q samples drawn from concourse are administered as Q sorts, which are factor analyzed and interpreted, leading to understanding. An example is provided of a concourse around the statement "It is raining," and demonstrates that schemata, .made operant by Q factors, and not message systems, are key factors in communication. Discussion focuses on applications in the physical and social sciences and humanities, and on implications for problems in a variety of areas.